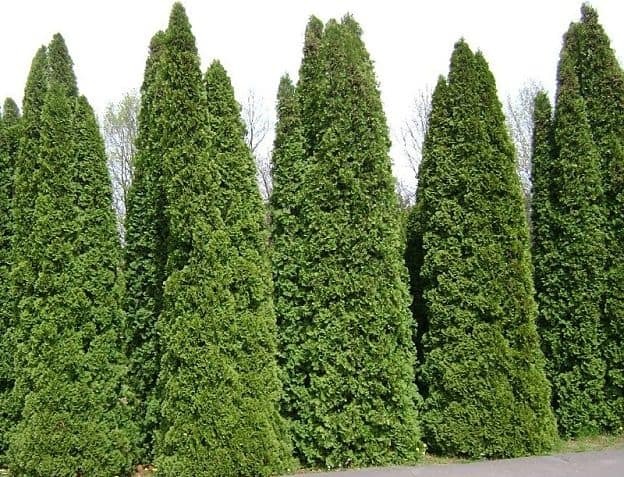 Other Common Names: Arbor vitae, American arbor-vitae, eastern arborvitae, white cedar, false white cedar, northern white-cedar, yellow cedar, tuja (Swedish), tuya (Spanish), thuya d’occident (French), Lebensbaum (German). The common name arbor vitae is from Latin meaning “tree of life” and refers to alleged medicinal properties of the plant. Habitat: Thuja occidentalis is native to North America and eastern Canada. Today the tree has become very popular as an ornamental plant. It grows best in moist soil. Plant Description: Thuja is an evergreen conifer belonging to the Cupressaceae or cypress family. The tree can grow up to 20 meters in height (66 ft). The tree’s crown is conical with a narrow, rounded top and straight branches. The leaves are scaly and the bark is red-brown, furrowed and peels in vertical strips. Thuja blooms with inconspicuous male flowers and produces small, elongated female cones with overlapping scales. Plant Parts Used: Young branches (up to one-year-old), twigs, bark, and leaves are used as herbal medicine. An essential oil is extracted by steam distillation from the leaves, branches, and bark. The oil is colorless or bright-yellow and has a crisp, camphor-like scent. The oil contains high levels of the substance thujone which is very toxic. Thuja contains an essential oil (0.4 to 1%) which mainly consists (up to 65% ) of the poisonous chemical thujone. Other ingredients found in the plant are sesquiterpenes, flavonoids, mucilage substances, tannin, and polysaccharides. The tree was used traditionally for centuries by the native Americans to treat a variety of ailments and later adopted by the European settlers. A decoction made from the young twigs and leaves was used to treat a cough, fever, headache, intestinal parasites, cystitis and venereal diseases. Externally, thuja was used as a poultice to treat burns, rheumatism, gout, arthritis, warts, and psoriasis. The Native Americans would burn the tree to produce thick smoke as it was their belief that the smoke could keep evil spirits at bay. 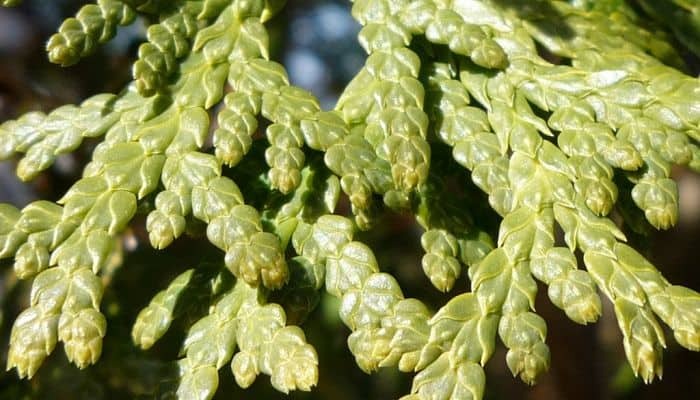 Today, thuja is mostly used against warts and polyps, but to some extent, it is also used as a remedy for acute bronchitis and other respiratory disorders due to the herb’s expectorant and anti-catarrhal properties. Thuja is a diuretic and has been used to treat cystitis and bed-wetting in children. Extracts of the herb can be applied to painful joints and muscles to increases blood circulation and thus reduce pain and stiffness. To get rid of warts the herb was used as a topical treatment and applied either as a tincture or essential oil. Usually, a topical treatment involving a tincture should be continued for a few weeks for the best results. The essential oil is only used to burn away warts. When the oil is used in this regard, glycerol is applied to the area surrounding the wart as a protection and then the poisonous essential oil is used on the wart itself. Some research studies have shown that thuja has antiviral properties although it is not yet clear which substances are responsible for this effect. Despite the fact that the herb has been used for hundreds of years in folk medicine there has been little scientific research on the therapeutic benefits of the plant, at least if compared with some other more known viral inhibitory herbs like echinacea (Echinacea spp). Thuja has also antibacterial and antifungal properties and can, therefore, be used for the treatment of infected wounds, burns and skin infections such as ringworm. Recently, German scientists demonstrated that Thuja strengthens the immune system by stimulating T lymphocytes and increase interleukin-2 production. The virus-resistant and immune strengthening properties of the herb can also help provide greater tolerance to chemotherapy and radiotherapy. The correct therapeutic dose of thuja as medicine may depend on few factors such as the user’s age, health, and several other conditions. It is advisable to contact fully licensed herbalist or other health care provider knowledgeable on medicinal herbs for the correct dose. Thuja should be used with great caution and only under the supervision of a qualified healthcare professional. The herb may have an abortifacient effect and should never be used during pregnancy or when breastfeeding. The substance thujone found in the herb is highly toxic, and if it is intended for internal use, it must only be used in very small amounts and never for a longer period than two weeks. Internal use of the herb can cause epileptic seizures, nausea, vomiting, diarrhea, abdominal pain, leg edema, palpitations and even coma. The characteristic of thuja poisoning is bleeding of the stomach lining and the heart muscle, as well as severe kidney and liver damage. Internal use of the essential oil can cause the blood pressure to drop, convulsions and in some cases death. 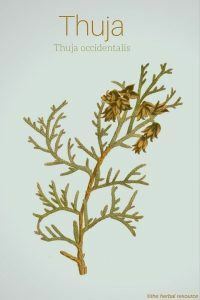 Foster, Steven and James A. Duke: A Field Guide to Medicinal Plants, Eastern and Central North America. New York, Houghton Mifflin Company 1990. British Homeopathic Association. 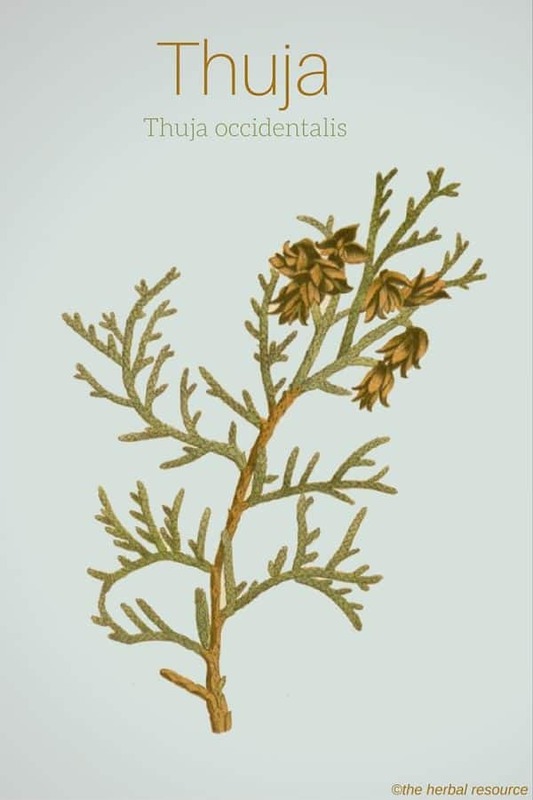 Thuja occidentalis. My dog is 11 yrs old and in the past few years he gets seizures and is on medication for the seizures. He also has lots of warts. I just started given him Thuja for the warts, I have read that one of the side effects of Thuja could be seizures. He is on Thuja for one week now. Yes Thuja is believed to cause seizures in some people so it might have the same effect in dogs. As warts are caused by viruses, I would talk to your vet in regard to other solutions for your dog’s wart problem. Warts have also been linked to an internal potassium deficiency so it might be a good idea to supplement with potassium but this is something your vet needs to decide. I’m glad you delayed giving this to your pet. I believe inadvertently hastened the death of their beloved pet by giving her this. My Lucy was put down this past Wednesday. She was almost 14 yrs. old. She was totally blind, had lumps and bumps all over her body. I took her to acupuncture once a week for her lameness. I’ve tried all sorts of “natural or herbal” supplements to try make her health better as I don’t believe in all vets treatments. I thought I would try this product called Thuja for her fatty tumors as an operation would be too much. I read all the raving reviews of this product. Old dogs, young dogs, people, kids….all thought it was the best thing since sliced bread. No warning whatsoever except for pregnant dogs. I purchased a bottle, they are small tiny pellets, said to give 3, I gave her only 1. She ate her dinner with gusto, like always, I gave her the pellet in a pill pocket and within an hour, she was hiding behind the couch. I called her and she stumbled out, her head cocked to one side, her eyes rolling in her head. She couldn’t get up, so I slept next to her all night thinking it would pass. It didn’t, we took her to the vet the next morning, they gave her nausea meds, anti-seizure meds and said to wait and see if she gets better. She didn’t after all day at the vet. The vet said it was a possible brain tumor and there was no way to see unless we took her up north to another vet with that capability and it would probably cost around $2,000 and that would only put a name on it. Then we would have to decide to operate or try and treat her. If we took her home like she was, she would probably starve to death as the couldn’t eat or drink. We opted to put her to sleep. I asked the vet if the Thuja was the cause, he said probably not, but could not say 100%. I am racked with guilt that I contributed to her death and possibly could have lived another 6 months or longer. Just a warning to everyone, please be careful what you give your animals. It was only AFTER did I fully research this Thuja and found out it could cause seizures. It wasn’t on the bottle or on the pet website. Thank you for letting me vent. Check dog’s stools for signs of bleeding too, maybe eyes for bloodshot. Note if after these two weeks the homeopathic medicine of Thuja is having any effect on the warts and tell us too! Follow the vet’s advice. Good luck. I’m so sorry for your loss. Thank you for sharing your experience with us. My dog has had cancer twice and I am trying to boost her immune system of vaccines that she has had. I heard Thuja helps with that. However, I will think twice after reading about your experience. It’s hard to say in your situation what actually happened but I hope you know your Lucy loves you still! You were doing what you thought best at the time so don’t feel quilty!